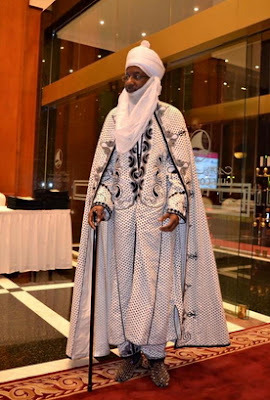 On Monday, former Central Bank of Nigeria Governor Sanusi Lamido Sanusi was honoured at the Global Islamic Finance Award that held in Bahrain where he received Int’l Islamic award. 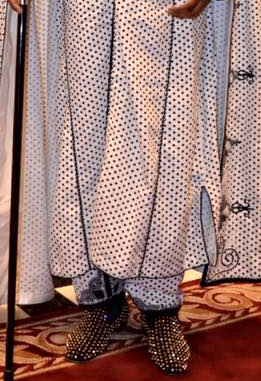 The monarch dressed in a traditional attire with a matching glittering shoes. He is one trendy traditional ruler. Stolen money, the man thief pass domestic rat. if him lik mak him go wear diamond bed room slipers e no concern me! abeg nigeria at 55 wia i fit go ce tiger meat chop? They are plastic pearls not diamond. That is by far better than having plenty girl friends.Or having baby factory or impregnating other people’s innocent daughters. How does it concern anyone. ?